With the holiday madness, home improvement progress has come to a screeching halt. And I’m ok with that. There’s plenty we accomplished and didn’t blog about, especially during the rush to get Cody’s apartment ready. For starters, we were facing a bit of a dilemna with the stairwell. Cody’s side-entry door opened up into the stairwell, which is nice and convenient. But to make it functional and safe, we needed a landing of some sort. We also needed a way to block this doorway off to keep the downstairs seperate. But since we’re sharing the laundry machines, and they’re on the second floor, we didn’t want to close it off with drywall. Teague, my hero, built a landing AND a custom door. 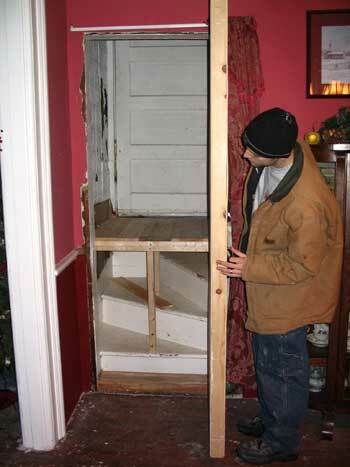 The door was made out of 2×4’s (cut down) and wood veneer, and is insulated so the sounds don’t echo back and forth. A sliding lock keeps it shut. It’s not the most beautiful thing in the world, but neither is the stairwell or the doorway opening – and it sure is functional! 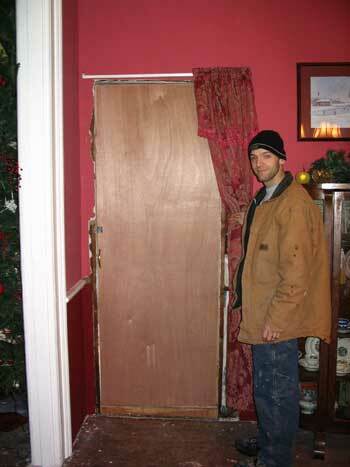 I still can’t believe he whipped up a custom door in just a few hours. He’s one handy guy. The stairwell when we moved in. Notice the nice dropoff from the door to the stairs. Super safe! Stairwell now, with the door open so you can see the new landing. Since we don’t plan on having a tenant forever, the apartment modifications were all designed to be undone without too much effort or waste. Hence, no concern for fancy-schmancy stuff here – just usability! I’m confused as to how the landing works. I’m sure that it’s just the picture, but it looks like it covers up the stairs and comes out like a waist high table downstairs. Can you explain how it really works? Sorry I confused you! The landing is really only useful to Cody – that is his entrance door, which opens onto the stairs to get to the second floor. If we want to go upstairs to do laundry, we hop up onto the landing – it’s easier than going out our front door and around to the side of the house with a full laundry basket. We don’t have to do it much, so it wasn’t worth building our own set of steps out into the dining room.